Stainless steel toilet partitions are a perfect choice for many customers thanks to their durability, easy cleaning, fire protection, and resistance to high humidity. 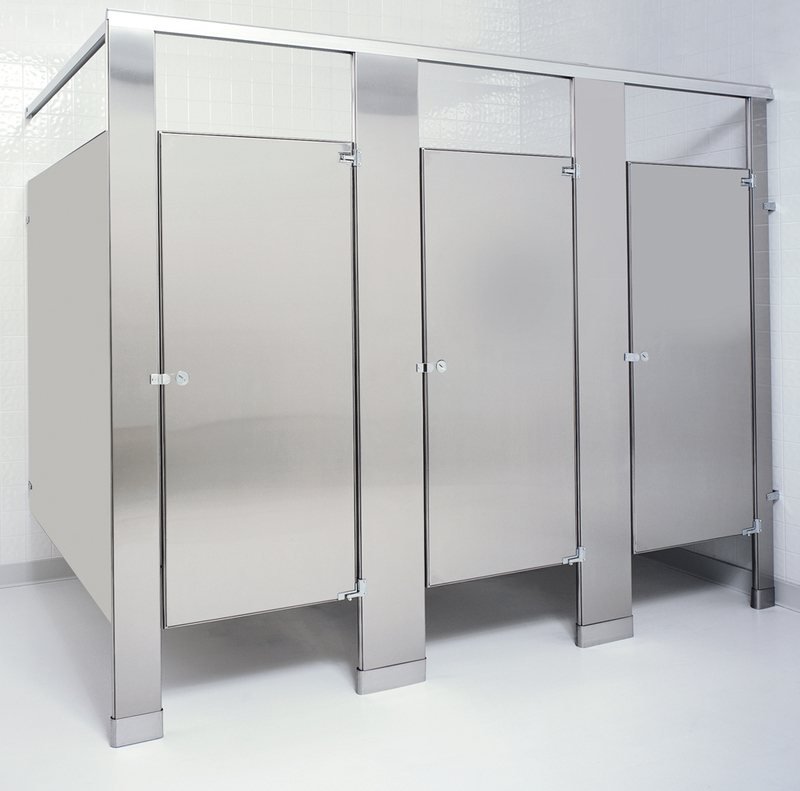 Stainless steel stalls can give any restroom area a modern, upscale, and luxurious feel without the high price. This option is ideal for high-traffic areas that are prone to vandalism since it is extremely durable and nearly indestructible. Even scratches are no match for vandals, since they can easily be removed from the stainless steel surface by buffing. When it comes to cleaning, stainless steel partitions and doors are incredibly easy to manage and require no extra effort to preserve their brilliance and shine. Stainless steel partitions are an affordable, high-quality option for your bathroom stall area that will save you money in the long run because you won’t ever have to worry about replacing them. Robert Brooke & Associates offers a variety of quality stainless steel bathroom options. If you are designing a restroom that does not fit the standard sizes, please send us your drawings by fax to 800-642-2406 or by emailing sales@robertbrooke.com, so we can better assist you with any specialty needs. Stainless steel bathroom partitions use a #4 brushed stainless steel which promotes a hygienic environment while offering excellent corrosion resistance and a clean appearance. The corners are unmatched for their clean, attractive appearance. The superior strength of a full corner weld creates a hygienic seal and prevents parts from loosening and detaching. Stainless steel is also available in a unique textured pattern of embossed stainless steel and offers added protection against abrasions, smudges, and fingerprints. Due to the nature of the material, we do not recommend stainless steel to be used in moist shower areas, as this product will rust over time. Stainless steel toilet partitions are some of the most expensive products we carry. These restroom stalls are often used within airports, restaurants, commercial businesses, and office buildings. Some of the top stainless steel partition manufactures include Hadrian Manufacturing Corporation, Global Partitions Corporation, Metpar Partitions, Mills Partitions, and Accurate Partitions Corporation. All five manufacturers offer quick shipping times for fast deliveries to our customers within USA. Most partition manufacturers provide a warranty of 5 years, however, the toilet partitions will last up to 35 years if properly maintained. Robert Brooke has been a trusted name in the commercial toilet partition business for over 48 years. We’re eager to help with the configuration, selection, and purchase of stainless steel bathroom partitions.